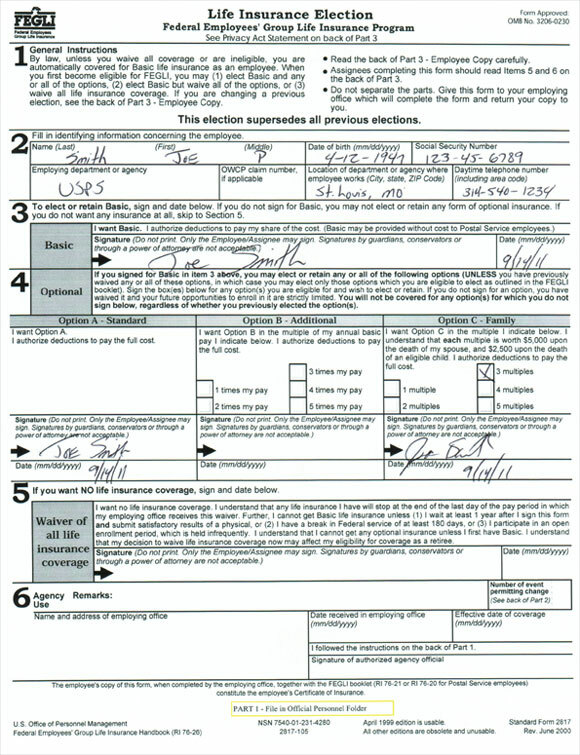 Instead of going through the headache of trying to find out who you have listed as your beneficiary (which means reviewing your full OPF and all your SF-50’s) you can just send in a new form and the new form will supersede anything they have on file. You can find the form you will need to use here. You will receive a stamped copy of the form back once the update is complete. To update your beneficiary with the TSP you will need to use form TSP 3. The instructions on how to fill out the form and where to send it are all included in the link. Again, by submitting this form it will supersede whatever you have on file so don’t worry about figuring out who you have listed right now. The only exception you need to keep in mind pertains to divorces. Whatever your divorce decree states will take precedence over any designation of beneficiary you may indicate with the government. If you have questions please feel free to ask and I want to wish all of you a happy new year! This letter is in follow-up to our article on FEGLI coverage http://postalbenefitsgroup.net/postal-news/what-postal-employees-need-to-know-about-fegli/. Now that you understand what coverage you have and how it changes you might need to know how to make changes to your coverage. If you are wanting to reduce or cancel your Postal life insurance there are a few steps you must take. This is very important because you need to make sure you understand what you are cancelling. To confirm what coverage you have you must refer to a code in the deduction section of your paystub that starts with IN then a number then another letter. If you need help in finding this code you can email us at david@postalbenefitsgroup.net. Once you have the form you will need to complete sections 2 and 3. Section 2 contains all your identifying information. Section 3 is where you will elect to KEEP YOUR BASIC COVERAGE. You need to sign and date in section 3 to keep your free Basic Life Insurance. If you fail to sign and date you lose the coverage and will not be able to get it back most likely. Section 4 is where you determine what you want to cancel. For example, let’s say an employee is wanting to cancel all of their Option B coverage. Option B is where you can elect up to 5 times your base pay. To cancel the coverage all you have to do is leave that section blank. If this same employee had Option A and wanted to keep that coverage they would sign and date in the Option A section. The same would be true if the employee wanted to keep Family Coverage or Option C. To keep it you have to sign and date in that section. It is important that you indicate the same number of units of family coverage you currently have. If you are not sure how many family units you have you can email us at david@postalbenefitsgroup.net. I have attached below an example form filled out for an employee who wants to cancel all of their Option B coverage but keep Option A and 3 multiples of Family Coverage. Once your coverage has been cancelled Shared Services will send you one of the copies stamped verifying the coverage has been cancelled. It typically takes 30-45 days for your life insurance to cancel. Changing life insurance coverage is very serious. If you are not sure what you have or how to work with the forms please feel free to contact us. We have had the privilege of working with numerous postal unions across the country. As we reach out to more and more states to help Postal employees we have run into some interesting challenges from certain unions. Our hope is to raise the awareness among Rural Letter Carriers in hopes some of you will stand up and help us reach the carriers the National Office has forgotten. Through 2009 and much of 2010 we spoke at several state conventions and district meetings. We had nothing but positive feedback from the officers and the members who attended those meetings. The theme was the same as it always is “Where have you been!” and “The Post Office doesn’t tell us any of this!”. Moving into 2011 we expected to see nothing but growth and expected to be working with several more states. That didn’t happen because the National Office sent a letter to all states prohibiting them from allowing private companies to attend or speak at any functions. Their reasoning is because it may bring liability back on the national organization. They are afraid if we speak at their convention you may assume we are endorsed (even though we clearly say we are not at the beginning of our seminars) and if anything goes wrong the national union could be sued. Our opinion on this is it is the classic case of throwing the baby out with the bath water. Postal Benefits Group is one of very few organizations who is qualified to teach and counsel Postal employees. Instead of the National organization working with us to find a way to address their concerns AND serve their members they decided to make a quick decision that served THEIR purpose not that of Rural Carriers. Many of these members would’ve appreciated the opportunity to make their own choices and would’ve appreciated any additional information they could get no matter the source. The unions serve a valuable role in negotiating for your best interests in contracts and with grievances. No one but the national organization can do that for you. The areas the national office neglect are education and training on retirement and benefits. They offer nothing. How can an organization who offers nothing in the way of education on retirement and benefits PREVENT you from getting that information from another source? Makes no sense and I doubt the national officers understand the impact their decision has on Rural Carriers all over the country. There are states out there who walk to the beat of a different drum. They understand that in some cases it’s ok to disagree with the national organization and do what they feel is best for their members. We look forward to hearing and working with these states in the future and with their help maybe someday National office will reconsider their irresponsible actions. OK, so you’ve met your MRA (minimum retirement age), or better yet, maybe another early out came around and you want to take it. Time to pick out balloons for the retirement party, right? Maybe not. Unfortunately, we’ve seen so many employees pay attention to what they’re ALLOWED to do, that they completely disregard what they can AFFORD to do. Retirement may seem like the ultimate freedom, but that may not be the case if you can’t pay your bills. First of all, make a detailed list of your monthly expenses. Refer to your last few months bank statements to make sure you’re not forgetting anything. Mortgages and car payments are not your only expenses. Food, entertainment, and spoiling the grandkids all need to be considered. Just because you don’t get a bill in the mail doesn’t mean it doesn’t cost money. Next, calculate your exact income in retirement. When looking at your monthly benefit on the annuity estimate that the government sends you, remember to take out medical coverage (which will roughly double – look in the upper right of the form), and don’t forget to take out a little for taxes as well. The average FERS employee that we see with 30 years of service and a 53,000 high three, after taxes, insurance, and leaving a survivor benefit, only brings home about 800 or some from their FERS pension. These same folks usually bring in about 1200-1500 in Social Security Income as well. For some reason, most people expect more. It’s much better to be aware of this ahead of time so there are no surprises. Finally, know the role of your TSP (Thrift Savings Plan). On the back of your statement you will find a number showing what your monthly benefit would be if you annuitized it. While this seems fine and dandy, read the small print. Luckily, the small print with the government is only 684 pages of size .01 font, so let me go ahead and point out some major implications here. First, if you take advantage of that monthly payment, you can NEVER change it. If your circumstances change, too bad. Next, you have NO access to cash. If you have an emergency, too bad. Also, the survivor benefit works exactly like that of your pension. So, once you pass, your spouse will get a survivor benefit. Once they pass, the government is off the hook. Your heirs will get nothing. TSP Loans can be a luxury or a curse depending on your situation and your use of the funds. While there are huge debates about whether you should or shouldn’t borrow from your TSP, we prefer to focus on an unknown cost the government charges you that most people don’t know about. When you take out a TSP loan the government prevents you from contributing for 6 months. When we first learned about this procedure we weren’t sure of the purpose of this rule. The only thing we have been able to determine from this policy is that is saves the government money. In order for a FERS employee to receive their matching funds on their firs 5% of TSP contributions they must contribute the 5% in each and every pay period of that year. You cannot get a match for past pay periods so there’s no way to “catch up”. Let’s take a look at a typical employee who takes a loan from their TSP and must wait the 6 months to contribute again. If this employee is making $50,000 a year the 5% match they would not receive for that 6 months would be $1,250.00. Because the employee is not contributing, the government does not have to make the match. Now take that $1,250 and multiply it over the thousands of Postal employees who take loans from the TSP and you can see the government’s motivation to prevent you from contributing for 6 months. When you are considering taking a loan from your TSP, please consider all the costs. Missing your match on your contributions is a MAJOR HIDDEN COST we feel you should factor in to your overall decision. We hope this helps you and do your co-workers a favor and forward this link to them. You just might save them thousands of dollars. When we do a seminar we always get questions about the codes on the Postal paycheck. The government does a really good job of complicating the most basic things and your paycheck is one of them. We’ve put together the most common questions and answers below – pass them along to your friends in case they have the same questions. 1) What is the number in the bottom right hand corner of my paycheck? Both FERS and CSRS employees contribute to their pension. When we say pension we are talking about the annuity you receive when you retire (not the TSP). The government contributes most of the money but you still contribute as an employee. The number in the bottom right hand corner of your check is the TOTAL you have contributed to your pension. The government has to disclose this number to you because it is your money. Technically, you could pull these funds out at retirement but because these funds are coming from the retirement bucket it would reduce your pension. This is why almost no one takes the money out. CSRS employees will have fairly large numbers where FERS employees will have much less because their pension is smaller. 2) Where do I see what I am contributing to the Thrift Savings Plan? This is an area where you need to be absolutely certain. Employees who do not understand what they are contributing sometimes find out when they are about to retire when it is too late. Locating your TSP contribution is very easy. Look in your deduction section of your check stub where all the taxes come out and you will see a TSP. Next to the TSP you will see a number of 01-30 which will be what percentage of your income you contribute. If you are contributing a whole dollar amount instead of a percentage you will see TSP$ and then the amount you are contributing. Let’s assume an employee is contributing $75.00 a pay period to the TSP. The code would read TSP$75. If you are a FERS employee it is very important that you are contributing at least 5% to get the full match from the government. DO NOT CONTRIBUTE A DOLLAR AMOUNT—MAKE IT A PERCENTAGE. If you are contributing a percentage as you get raises you will ensure you are getting the full 5% match. 3) What is the Insurance Income on my checkstub? This is another area where we get a lot of questions. The answer lies in IRS regulations. Under IRS rules you are able to receive $50,000 of free life insurance from your employer without any tax consequences. For Postal employees the free life insurance is your Basic Life Insurance. The math on calculating Basic Life is your base pay rounded up plus $2,000. When you do the math this puts many employees over the $50,000 limit. The government then takes the premium the Post Office pays on your behalf for the amount over $50,000 and reports it as income to the IRS. It never adds up to much, but it is good to understand why this happens. 4) I have a code that looks like this IN4Z3 in the deduction section of my check, what is it? This code represents your Postal Life Insurance that you elected to pay for when you first hired on with the Postal Service. The code tells us what coverage you have, and what age group you are in. If you are uncertain as to what coverage you have you can contact us and we can review the information with you. For more information on how your Postal Life Insurance works check out What Postal Employees Need To Know About FEGLI. 5) What does the code HP mean? The HP code is your Health insurance premium. 6) I have a deduction that says Retire 1 or Retire 8, what is that? If you will remember when we were talking about the number in the bottom right hand corner of your check we said that every employee contributes something to their pension and that the number in the bottom right hand corner was the total you have contributed over your whole career. Well, the Retire deduction is the amount you contribute each pay period to the number in the bottom right hand corner. The number in the bottom right hand corner only changes once a year so you won’t see it change every pay period. We hope this article helps you understand your check a little more. Do your friends a favor and post the link on Facebook or email it to them so they will have the benefit of the information. Be safe out there! FERS employees have a lot of moving parts they have to keep up with when it comes to benefits and retirement. It’s not enough to know what your pension check is going to be. One of the most important aspects of your FERS retirement is the FERS Special Supplement. A lot of people have never heard of the Supplement and others have heard of it but don’t know how it works. The supplement is a substantial benefit that every FERS employee needs to understand in order to evaluate early outs or normal retirements. What is the FERS Special Supplement and why does it exist? The supplement exists because Social Security is a significant part of a FERS retirement but a benefit you cannot claim until you are 62. Most employees will see their minimum retirement age in their mid 50’s. The supplement is a payment from the Office of Personnel Management that is in addition to your pension and is meant to be a “substitute” for your Social Security until you are 62. Once you qualify for Social Security at 62 the supplement is turned off and you will draw your normal social security. Does Everyone get the Supplement? No. There are three categories of employees who will receive the Supplement. Employees who have served 30 years and have reached their Minimum Retirement Age will qualify for the Supplement. Employees who have reached at least age 60 with 20 years of service will qualify for the Supplement. Lastly, employees who have been offered the Early Out will be offered the supplement BUT CANNOT DRAW THE SUPPLEMENT UNTIL THEY REACH MINIMUM RETIREMENT AGE. How much is the Supplement? Joe now applies the above percentage (75%) to his Social Security at age 62 and will receive a Supplement of $900 a month from his Minimum Retirement Age (56) until age 62. Once he turns 62 he will draw his normal social security check of $1,200. One thing employees have to be careful about is if they are planning on retiring and getting another job. The government treats the Supplement just like Social Security. If an employee makes more than $14,160 in another job, for every $2 they make above the limit their Supplement will be reduced by $1 in the following year. To put it in plain English – if you make roughly $28,000 while you are on the Supplement you will not get the Supplement the next year because of the Social Security Earnings test. They look at this income on an individual basis so your spouse’s income will not affect you. We cover this specific issue because many employees who are considering Early out think they can go get another job. They can, but they have to be aware of the Social Security Earnings Test. Another quick note you should know. You don’t have to apply for the Supplement. It happens automatically when you retire if you are eligible. It’s also important to note that drawing the Supplement does not impact any future Social Security checks. In other words, you are not penalized for drawing it like you see drawing your Social Security between age 62 and 66. The FERS Special Supplement is a good example of a great benefit very few people understand. It’s one of those things buried in your Employee Almanac and written in such a way it might as well be written in Japanese. At Postal Benefits Group, we like to talk in plain English and help you come up with the numbers you need to know before you retire. We believe in Straight talk with straight answers. If you have questions about your decision to retire, the Supplement or any other issue, please give us a call. We want you to be confident and comfortable about your decision to retire. The TSP is an excellent savings vehicle while you are working and for FERS employees there is matching on up to 5% of your contributions. When you get closer to retirement however it is important to understand your options to ensure you and your family receive the full benefit of the TSP. Most employees do not understand the role of the TSP in their retirement. The vast majority of employees go through the retirement process and ANNUITIZE their TSP because this is most common option you receive from Shared Services. Let’s look at some of the implications of a normal annuitization of your TSP through the Post Office. What happens when you Annuitize? First, when you annuitize you are giving up your cash in exchange for a monthly check. Once you make this decision you no longer have the cash. This can cause serious problems if a family emergency arises. Second, your money no longer grows. When you annuitize your TSP an interest factor is added at the beginning and it never changes. Everyone knows we are in one of the lowest interest rate environments in 50 years. This means this is the worst possible time to sell your TSP balance to Met Life (the company that administers annuities for the government). Lastly, the biggest problem with annuitizing your TSP is the most significant. When you annuitize your TSP you are disinheriting your heirs. Once you convert your TSP to monthly payments you are essentially turning your TSP into another pension. Think about your pension for a minute. The only two people that can be paid from your pension are the employee and spouse. When you annuitize your TSP you are guaranteeing your kids will never see a dollar. Shared Services does not explain these implications and as a result most employees make this catastrophic mistake. Our goal in writing this article is to make sure you understand these implications. What should you do……. it depends. Each employee has specific situations and circumstances that must be evaluated before taking action with their TSP. Our belief is there is no “one size fits all” and each person should be counseled by an expert on their TSP options. As soon as you turn 59.5 you need to understand your options with the TSP. We encourage all employees who have met or exceeded this age to contact us. There are a lot of factors that go into a decision such as this and you should understand EVERY option. Postal Benefits Group has been serving thousands of Postal employees across the country through its retirement seminars, and their book THE POSTAL BOOK. If you have questions about your TSP and other options please feel free to contact us. Most of you are probably aware you have life insurance through the Post Office. We feel it is important to understand every aspect of your FEGLI coverage and in this article we will cover everything you need to know. If you have additional questions beyond this article please contact us, we will be happy to help. Now let’s get started! Every career employee has Basic Life because the Postal Service gives it to you for free. They calculate this as your base pay, rounded up, and then they add $2,000. This amount goes up with raises you receive. Hopefully you never have to use this but if you do it will be very helpful. If you are diagnosed with a terminal illness and you have 9 months to live you can access your Basic Life coverage while you are still living. It’s basically an accelerated payment on your life insurance. Option A is a flat $10,000 policy. This is coverage on your spouse and dependent children. Family coverage is issued in units. Each unit is worth $5,000 on your spouse and $2,500 on each dependent child. If you have 5 units you would have $25,000 coverage on your spouse and $12,500 on each dependent child. This is the optional coverage that everyone needs to understand. This option allows the employee to take 1-5 times their base pay as additional life insurance. Our experience has been that over half of all Postal employees have 5x their base pay. Most employees “load up” on the benefits when they’re hired assuming everything is great without really understanding the details. This is where people get in trouble. It’ s pretty easy to see the trend. . Every time you get 5 years older the price goes up. The more likely you are to use the coverage, the more expensive it gets. As a general rule if you are healthy you need to get rid of this coverage as soon as you can and replace it with normal coverage you can get in the private sector. By normal I mean coverage that does not increase in cost. The sooner you do this the lower rates you will see on your new policy. On the flip side if you have serious health issues or if you smoke, you are in most cases better off keeping this coverage as long as you can afford it because private companies will not be any cheaper. If you’re like most employees you aren’t sure what coverage you have because you haven’t looked at it since you got hired. For those of you who need a little help we have created a website specifically for this purpose. All you need to do is visit www.replacefegli.com. There’s a copy of a real postal paycheck stub to show you where to find the code that indicates what coverage you have. You input your code and your information on the form and send it to us. We take that information and reply back to you with what coverage you have as well as the costs both today and later in your career. Information is power and the more you know the better decisions you can make for you and your family. We encourage you to copy and post this article in your swing room or break rooms. Almost none of your peers understand these details and you will be doing them a huge favor exposing them to this valuable information. Everyone knows today’s Post Office is very different from what it was just 10 years ago. The day you lost your local HR representative was the day thousands of Postal employees lost. Postal Benefits Group’s mission is to fill the gap that was created and bring you the information you need and deserve. In this article we want to cover some problems we have discovered in our benefit reviews. We hope you learn about each of these issues and hopefully avoid any problems in the future. Most employees understand their Basic Life insurance is free. This insurance is no longer free when you decide to retire. The cost of your Basic Life Insurance in Retirement is listed on your annuity estimate. You can expect to pay $100/month or more for $50,000 of Basic Life Insurance. Most employees make the decision to drop all of their life insurance at retirement and this can be a big mistake. When you complete your retirement paperwork you will make the choice of how much of your Basic Life Insurance you want to retain in retirement. Our suggestion to you is to always keep at least the 75% reduction in your Basic. The reason is pretty straight forward. If you are retiring at 55 or 56 you will only have to pay about $8/month for 25% of your Basic Life Coverage. This is fairly inexpensive but it gets even better. Once you turn age 65, you no longer have to pay for the 25% coverage amount. It is essentially a free burial policy for the rest of your life as long as you keep at least 25% of your Basic at retirement. There are probably a few of you who are putting the maximum allowable ($16,500) into your TSP. We want you to be aware of a very important policy the TSP enforces all the time. If you are a FERS employee you are obviously entitled to matching. Employees who are putting in the max can run into a problem if they are trying to put in the $16,500 over a period of less than 26 pay periods. The TSP will only give you matching on your contributions if you contribute to the TSP each and every pay period. If an employee has reached the $16,500 maximum in September, he/she will not receive matching on the pay periods from September until December 31st. The TSP (because you have met your max) will not accept any contributions once you hit the limit. If you want to do the max, take the $16,500 and divide it out over 26 pay periods so you don’t leave any matching funds on the table. A typical scenario is a CSRS or FERS employee retiring at 56 or older but not yet 59.5. Most employees do not access their TSP funds for fear of paying the 10% early withdrawal penalty. Under IRS rules as long as you are 55 or older and you RETIRE you can access TSP funds without paying the 10% early withdrawal. It would not make sense for the government to allow you to retire at ages in the mid fifties and not give you access to your retirement funds. This provision is not well known but can make a big difference in the retirement decision. We encourage each of you to take responsibility for the information you need to make retirement decisions. If you are unable to get the answers you need from the Post Office, we are happy to help through our seminars and one on one benefit reviews.